The ultimate Watchpoint: Gibraltar set with Mercy, Reaper, Winston and Pharah for the Overwatch® fan! For the Overwatch® fan, the iconic Overwatch rocket and launch tower from one of the game’s most popular maps with LEGO® Overwatch Watchpoint: Gibraltar 75975! 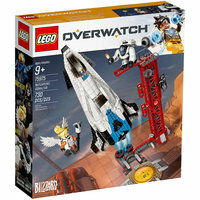 Based on the internationally acclaimed team-based action game, this building set features an Overwatch rocket that splits into 2 separate rockets, and 3 Overwatch characters. A Bastion to build and display for the Overwatch® fan! 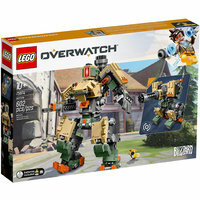 A fully reconfigurable LEGO® Overwatch® 75974 Bastion figure for your favorite Overwatch fan! One of the most recognizable Overwatch characters from the internationally acclaimed team-based action game, this buildable toy display model can be configured ifrom recon mode to sentry mode without any rebuilding! For your favorite Overwatch® fan—2 iconic tank heroes with D.Va & Reinhardt! 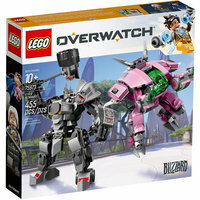 For your favorite Overwatch® fan, a buildable mech suit and powered armor with LEGO® Overwatch 75973 D.Va & Reinhardt! Each of these instantly recognizable Overwatch tank heroes features an Overwatch minifigure so fans can place the highly-detailed Overwatch characters inside through the hatches that open. Immerse your favorite Overwatch® fan in the Dorado map with Soldier: 76, Reaper and McCree! Now your favorite Overwatch® fan can build an iconic Dorado building and payload truck with LEGO® Overwatch 75972 Dorado Showdown! 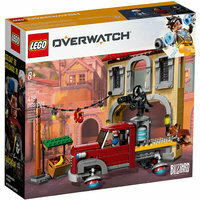 Based on the internationally acclaimed team-based action game, this Overwatch building set features an instantly recognizable building from the popular Dorado map and 3 characters, Soldier: 76, Reaper and McCree. Now your favorite Overwatch® fan can build the Hanamura dojo with dragon brothers Hanzo and Genji. 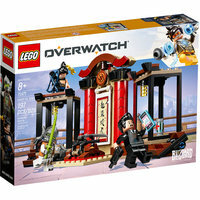 Now your favorite Overwatch® fan can build the Hanamura dojo in LEGO® bricks with LEGO Overwatch 75971 Hanzo vs. Genji. Based on the internationally acclaimed team-based action game, this Overwatch toy recreates the epic face-off for the Hanamura dojo between the rival dragon brothers Hanzo and cyborg ninja Genji. Build your very own Overwatch® payload from the Watchpoint: Gibraltar map! 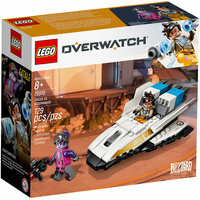 Immerse your favorite Overwatch® fan in epic missions with this LEGO® Overwatch 75970 Tracer vs. Widowmaker set. Based on the internationally acclaimed team-based action game, this set recreates the drone satellite from the Watchpoint: Gibraltar map where Overwatch heroes Tracer and Widowmaker battle for control of the payload.